As promised in my Sept. 9 post of “The Science Behind Fall Color”, I would address trees and shrubs with outstanding fall color. It was hard limiting it to only ten trees and ten shrubs, since I found 5 common shrub species of maples alone, so I cheated a bit and grouped the maples, oaks, etc. into one group so that my list was not entirely all maples. I have seen the below plants with reliable fall color in northern, southern and eastern landscapes. These plants “light” up the landscape in autumn. For outstanding, long lasting autumn color, plant the below trees and shrubs with herbaceous plants which bloom in fall such as asters, mums, sedums, monkshood, toad lilies, and Japanese anemones. Do not forget ornamental grasses with their showy seed heads extending the season of color and texture. 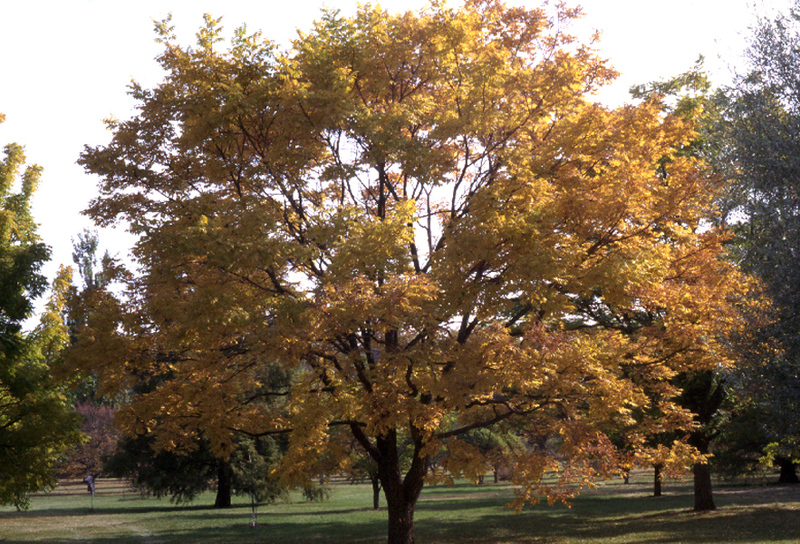 We used to recommend ash for fall color, but not any more due to emerald ash borer. 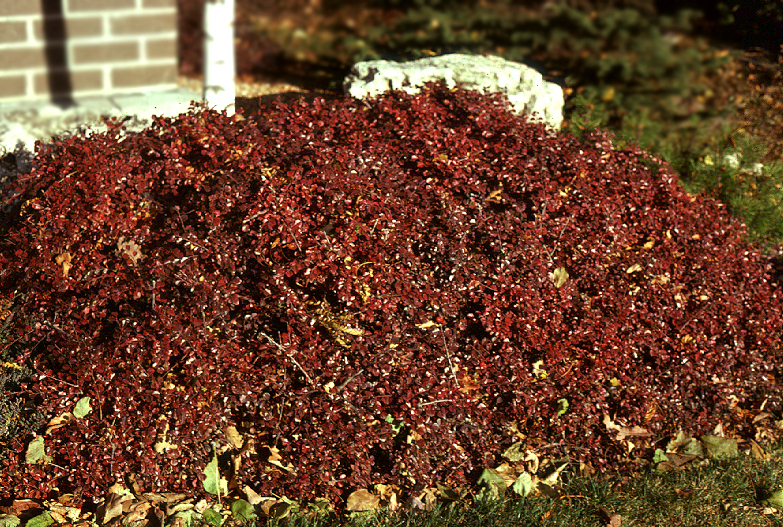 Japanese barberry and burningbush are tops for fall color, but both species are highly invasive and not recommended. There are more plants with great fall color than the ones below. I would love to hear your favorites! In many parts of the U.S., particularly the northern U.S., we are blessed each year by nature’s display of bright color dotted through the landscape. Fall color of leaves at the end of the growing season provides a remarkable encore in the landscape. There are many trees and shrubs with great autumn leaf color and I will address some of them in my next week’s post, but this week, I will talk about what actually happens inside the plant during autumn. As the days get shorter and temperatures start to cool, particularly at night, the season changes from green leaves into a kaleidoscope of yellow, orange, red, purple and bronze shades. There are a variety of factors that interact and play a role in determining how colorful the display will be. Plant leaves contain several pigments that determine the color that will appear and variations arise when different concentrations of pigments are combined in the leaf. Chlorophyll is the green pigment in leaves. This critically important pigment captures the energy from the sun and uses it to change water and carbon dioxide (CO2) into oxygen and sugars (carbohydrates), i.e. the plant’s energy source for growth and development. In autumn, chlorophyll breaks down faster than it is produced, revealing the other plant pigments and their colors. Carotenoids are responsible for the yellow, orange and a few red pigment colors. This pigment is always present in the leaves during the growing season, but the colors become more evident as the chlorophyll breaks down in the leaf. In addition to providing us with a beautiful display, carotenoids protect leaves from harmful byproducts of photosynthesis. Since carotenoids are always present in leaves, yellow, gold and orange colors are least affected by the weather. Anthocyanins are responsible for most of the red, pink, and purple colors we long for in autumn. Sugars in leaves accumulate as active growth slows down in autumn permitting the production of anthocyanins. These colorful pigments act as an internal sunscreen to protect the photosynthetic system allowing plants to recover nutrients from the leaves more easily as the temperatures decline. What about plants that have no anthocyanin pigments? These plants are usually more resistant to damage from bright light so they have no need to produce these protective anthocyanin pigments. 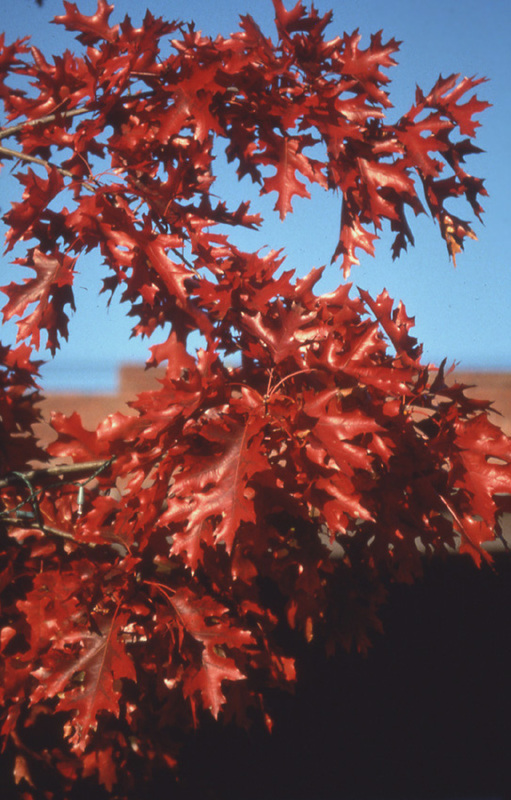 Tannins are not considered an actual plant pigment, but are responsible for some of the tan and brown colors we see in oaks and beeches in the fall. During the summer, most of a plant’s nutrients are located within the leaves. The shortening of day length and cooler temperatures, particularly at night, signal the plant to begin preparing for winter by transporting carbohydrates (sugars) and mineral nutrients from the leaves to stems and roots for storage in the plant to be reused the following spring. A layer of cells at the base of the leaf stalk (petiole), called the abscission zone, gradually closes off the flow of sugars and minerals into and out of the leaf. In a process called senescence, chlorophyll breaks down causing the leaves to change color and eventually fall off the plant. 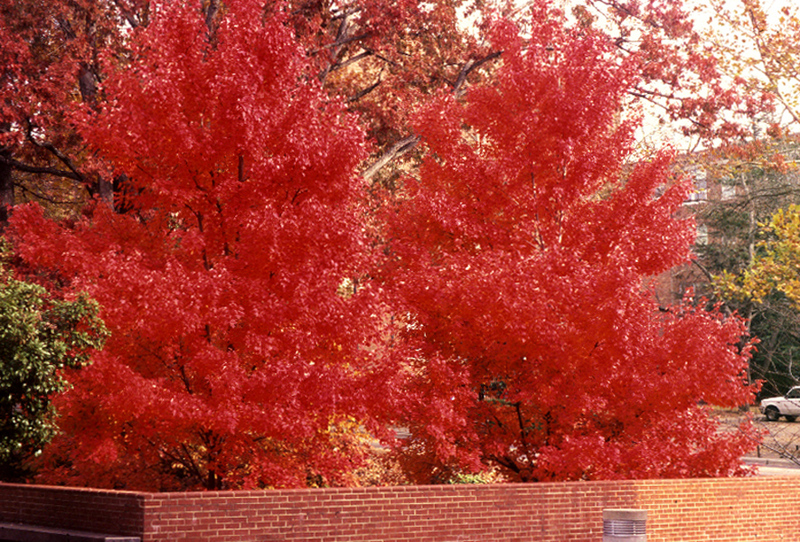 Many factors play a role in determining when fall color occurs and the intensity of the color. We cannot predict each summer how the autumn leaf color will be in the landscape. For example, peak (best) fall color can shift by as much as two weeks ahead or behind the normal time peak color occurs year to year based on the weather. Plants that are in transplant-shock (newly planted), drought stressed, nutrient deficient or suffer from insects or diseases may have poor fall color or the exact opposite; they may have better fall color due to increased production of red pigments. Good soil moisture levels throughout the growing season followed by a dry fall can improve the intensity of fall color. 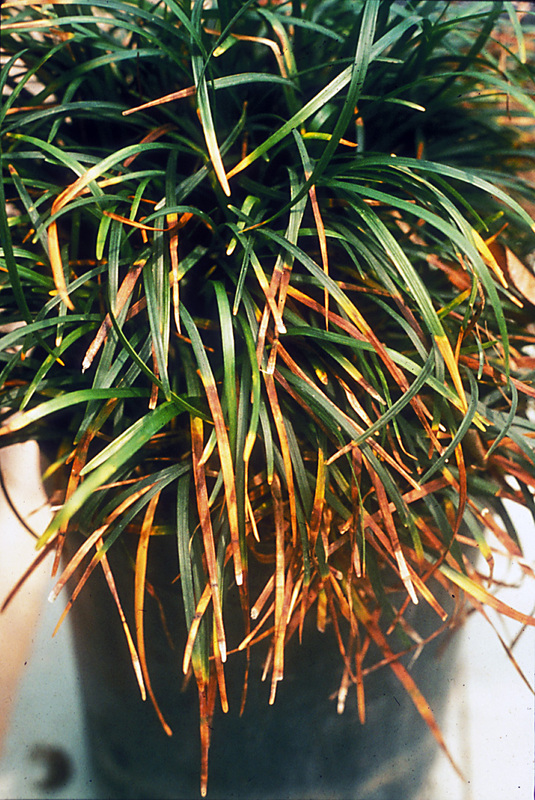 On the other hand, excessively wet or drought conditions can cause poor color development. Drought conditions can cause leaves to dry, curl and drop before fall color has sufficiently developed, especially on newly planted material. 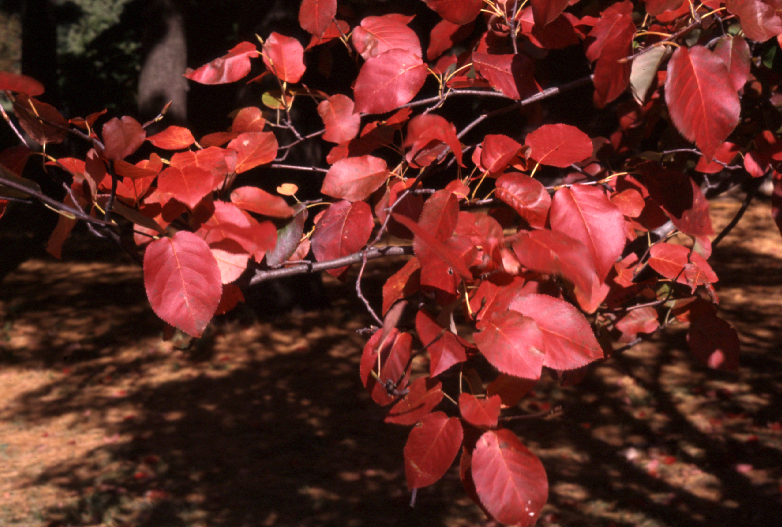 However, moderate drought conditions may actually improve fall color development in some species, though these same plants may suffer during winter and have dieback apparent in spring. Cool, dry, sunny fall days with cooler night temperatures stimulate anthocyanin production resulting in bright reds and purples. In contrast, very warm autumn weather may reduce the production of these pigments. 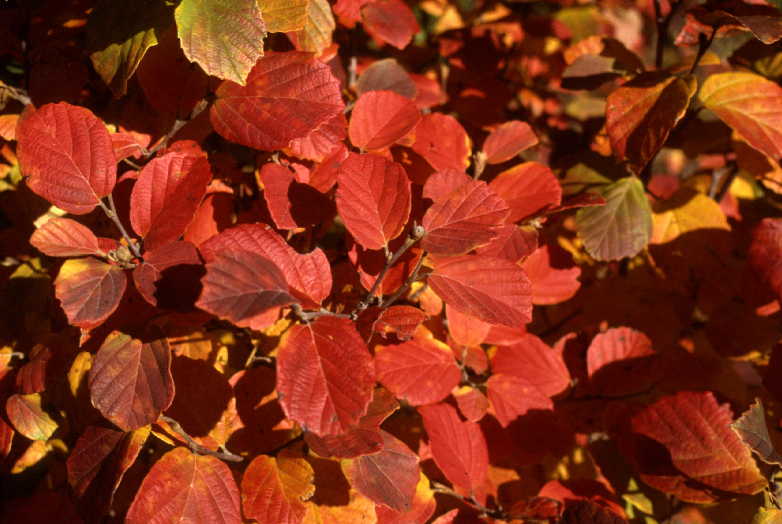 During unusually warm autumns, plants may accelerate fall color development, shortening the time leaves remain on the tree or shrub. Early, hard frosts may also severely damage leaves, arresting further fall color development before the brightest colors are revealed. 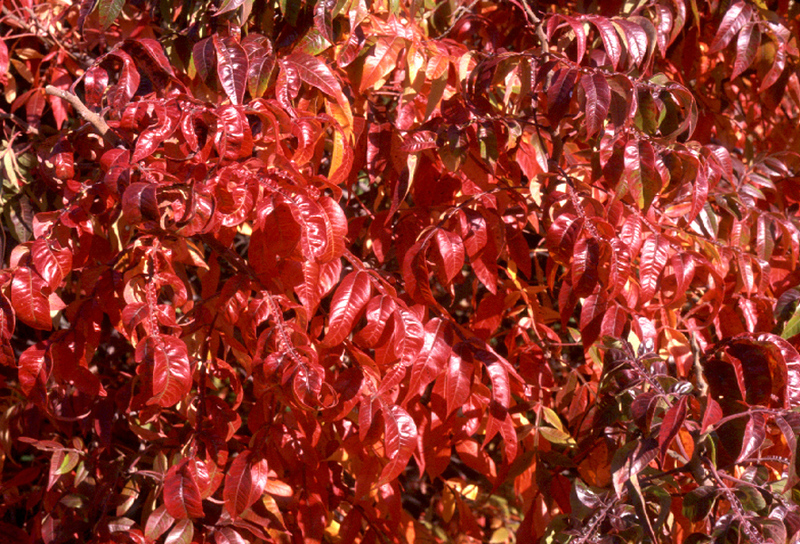 Sufficient sunlight is required for leaves to produce the best coloration. Plants growing in dense shade will usually fail to develop the intense red and orange colors we have grown so fond of each autumn. High soil pH and deficiencies of the various essential mineral nutrients, such as nitrogen, phosphorus, magnesium, iron and high levels of the non-essential element sodium can all affect the intensity of color change in leaves. High sodium soil levels, most likely due to excessive road salt (NaCl) application the previous winter, not only stresses plants and prevents proper water uptake, but also can negatively affect autumn leaf color. Of course genetics play a key role in the intensity of fall color development. This is why some seed produced trees in the forest have great fall color, while seedlings from the same tree may have less intense or even no fall color. This is where plant cultivars come into play. A nursery person will select plants demonstrating superior fall color, improved cold hardiness, increased pest resistance, better growth form, etc. These superior plant choices will often have a cultivar name associated with it. 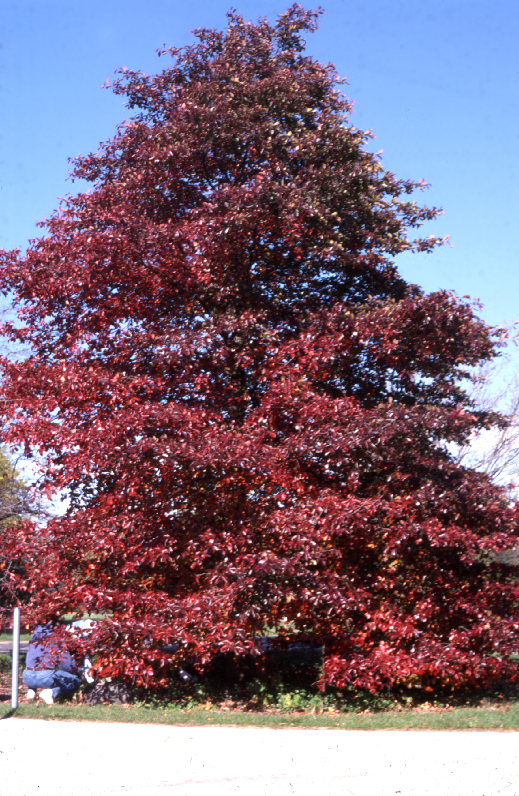 For example, seedling grown red maple (Acer rubrum) will display a range of fall color from green, yellow, yellow-orange, orange, orange-red, red and purple. As gardener, we tend to choose what we like, mostly the orange, red to purple colors. If the plant is not already in commerce, the grower will select the best seedlings for fall color and vegetatively propagate and grow those particular seedlings, offering these new selections to other nurseries or garden centers. It is a win-win for both the nursery and the gardener! With many new nursery catalogs arriving in my mailbox at work for 2016 introductions, I thought I would focus this blog on “new” plants. With all the publicity and marketing that goes on for new plant introductions, you would think that they are the next best thing since draft beer or even bread! I am a bit cynical and question whether these new plants really live up to their performance expectations and ornamental attributes. With so many new hydrangeas, coneflowers, coralbells, spireas, etc. released each year, you may ask why am I so cynical? Why would I not jump on the bandwagon and promote all of these new plants like so many garden centers are doing across America? Let me explain. A decade ago, I conducted research trials evaluating 20 new or recently introduced cultivars of “hardy” shrub roses, many of which are not even on the market anymore. I chose three locations in the state of Wisconsin, each having their own unique soil types, pH, soil drainage and fertility, rain/snowfall and cold hardiness zones. I replicated each of the 20 cultivars ten times at each location and arranged them into blocks with each cultivar represented in each of the ten blocks. The roses were randomly selected for each block and planted, mulched, watered with an application of a slow-release fertilizer. Plants were watered for the first year only as needed. To properly analyze plants for various traits, I allowed the roses to establish for a year with evaluation initiated the following spring. The only care the roses received the remaining years were application of a slow-release fertilizer, weeding and pruning of dead wood following winter. I was trying to replicate conditions that are common in most landscape settings. I did not spray any insecticides or fungicides to any of the roses, regardless of how bad they may have looked due to pests. After the first winter, I evaluated the roses for winter injury, which they all experienced. The roses were all on their own root systems so if they died back significantly, the new growth would come from the same root system and produce flowers that spring. To some extent, they all grew, though voles killed some of the roses. After the roses starting growing, I evaluated them monthly at all three locations for insects and diseases as well as flowering (amount, size, duration of bloom, etc.). I also measured the plant’s height and spread. A few roses had good fall color. The first year of the trial, the roses all bloomed prolifically. So, one would think that all 20 cultivars are ideal. Not so fast, or “but wait, there’s more” as the television salesman would say to viewers in TV land about a new product. The “real” evaluation started in year two. 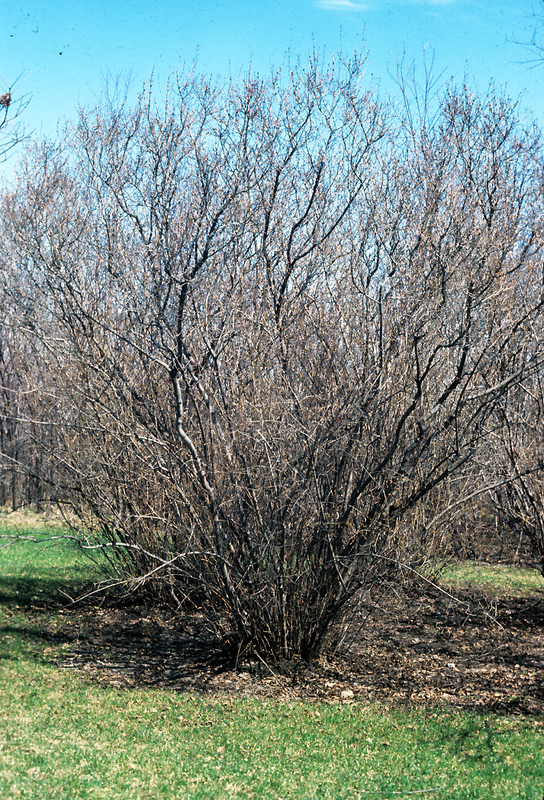 In year two, amount of dieback and winter survivability was recorded. To my surprise, the roses in the zone 3 location (boy, that’s cold) had better winter survival than the roses in my zone 4 and 5 location! This is due to consistent and significant snowfall in the most northern location compared to sporadic snowfall and lower amounts in the other two locations. I also evaluated the roses during the summer and fall for flowering, pests, and hip production. Contrary to the catalogs, many of the roses had hips, but some of them never colored up before the cold temperatures arrived at the three locations. Flower production was cited as being continuous all summer by their introducers, however, this was not true for some of the cultivars evaluated. Disease resistance was the most alarming quality I evaluated with many of the so-called “disease resistant” roses being the exact opposite. I explain all these variables to demonstrate what is involved in proper plant evaluation. 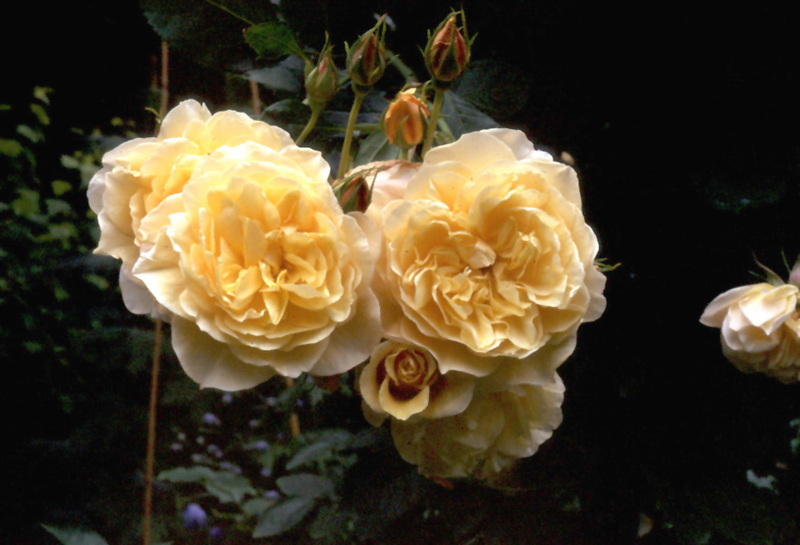 For a complete report of my rose research trial, see: Jull, L.G. 2004. Hardy Shrub Rose Research Trials. Combined Proceedings of the International Plant Propagators Society vol. 54:429-434. 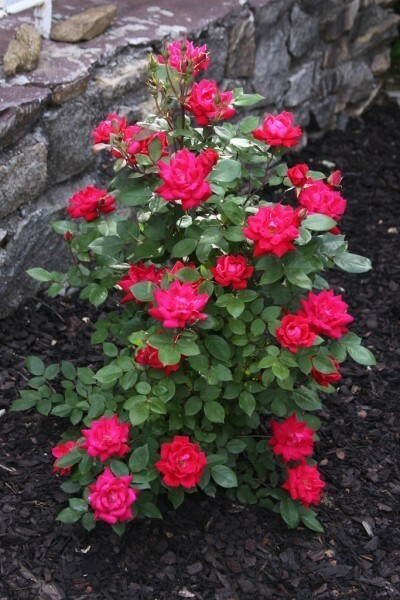 Now, you may ask, “Why are these new plants, including roses, promoted by these large nurseries as being the best plant around when in effect, they are not?” Many new introductions are from nurseries that trial their plants in their location only. So a plant that performs well in the state of California might not perform the same in Michigan and vice versa. There isn’t the scientific rigor applied to these new plant evaluations that would occur by non-biased, university researchers who have no stake in selling or promoting plants to the public. This is where the beauty of applied, scientific, university-based studies can play a huge role. Also, these new plants should be evaluated over numerous years, at various locations/soil types, climates, with appropriate replications of each new plant in a random arrangement (not all planted together). This type of quality research is done by a few large nurseries but it is seldom done this extensively by others anymore as demand for new plants is never satisfied and the cost of trialing over several years and locations is too costly. Unfortunately with increased costs and significant budget/program cuts, most university research is now geared toward larger, basic science studies that have high indirect costs built into the grants. These funds, usually 50% or more of the grant total, go directly to the university to cover overhead. The researchers do not see or can use overhead funds. Ornamental plant evaluation research is now considered either non-fundable by granting agencies, not “scientific or scholarly” enough by their own departmental colleagues or provide significant overhead funds back to the university. Some researchers rely on their various nursery and landscape associations for small amounts of research support, while others try to piece meal together small amounts of research funds. With the increasing costs of land (yes, we do have to pay for research space at university research stations), plants (not all are freely given to the researchers), labor, supplies, etc., it is becoming critically important to seek alternative funding sources as most federal and state granting agencies do not fund ornamental plant evaluation research. Many of the new initiatives for federal grants seek to fund food crop based research, especially in organic and sustainable food production. Applied ornamental horticulture plant evaluation research at universities has plummeted with most new plant evaluations conducted by the large nurseries that introduce these plants. There is another source for evaluation of these new plants. 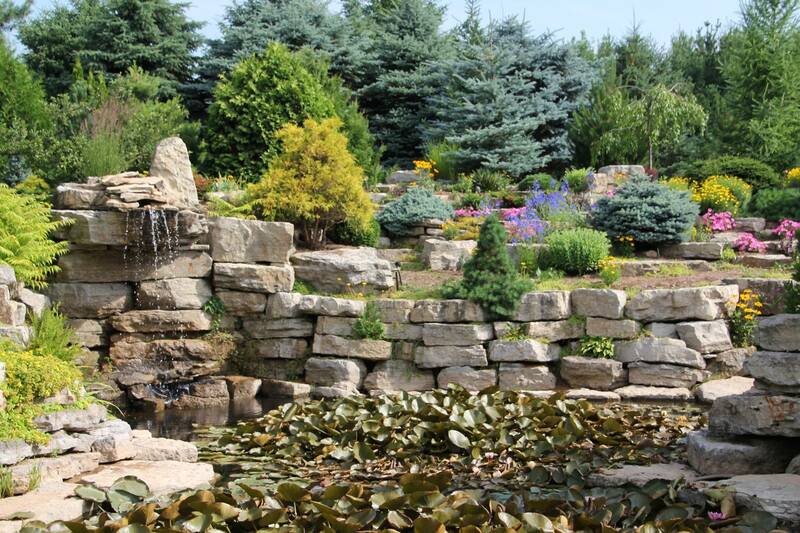 Various arboreta and botanical gardens around the U.S. are conducting evaluation trials. I am a fan of these studies as these gardens and evaluators are also not in the business of selling plants and can provide some analysis, though it is usually only at one location. Richard Hawke, Chicago Botanic Gardens Plant Evaluator and Horticulturist, has done an excellent job of evaluating many species of herbaceous perennials and a few woody plants. 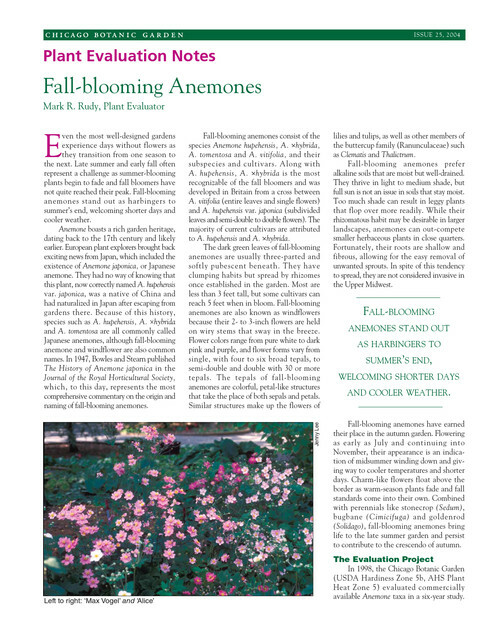 He publishes Plant Evaluation Notes: (http://www.chicagobotanic.org/research/ornamental_plant_research/plant_evaluation), a series of wonderful publications that help both the amateur and professional gardener to choose appropriate plants for the Upper Midwest. There are other botanical gardens and arboreta that do the same, with evaluations based on their local climatic conditions. I often rely on Mr. Hawke’s recommendations when choosing herbaceous perennials in my Wisconsin garden and have yet to be disappointed. So the next time a new plant comes across your way, think twice before buying it. There is the philosophy “Buyer Beware”, and I do recommend people to buy plants, but instead of buying 10 of one cultivar, try one or two of the new plant and make a judgment call the following year or two after you planted it. This is especially important for landscapers who design and plant large amounts of plants. You might be surprised to see the “best thing since draft beer” plant being anything but that. As some of us know, there is nothing better than draft beer (or whatever beverage you really like). I thought today’s post would feature two awesome plants that are relatively new or unheard of in the industry. Both of these plants have performed well in my own garden and survived our two hardest winters recorded since the 1970’s. Many plants suffered severe winterburn or even death due to extremely low temperatures, but not these two plants. They may be harder to find in the nursery/garden center, but are well worth it and have huge ornamental impact all growing season. The first is variegated fiveleaf aralia, Eleutherococcus sieboldianus ‘Variegatus’ (formerly Acanthopanax sieboldianus ‘Variegatus’). I know, a really horrible, long scientific name for such a great plant. Now before I go on about this particular cultivar, I need to let everyone know that this is the cultivar you want, NOT the species that has all green leaves. The straight species is weedy, grows too large for most landscapes and is not colorful. The variegated cultivar is a real showstopper! It is low maintenance, grows slowly and rarely needs pruning. 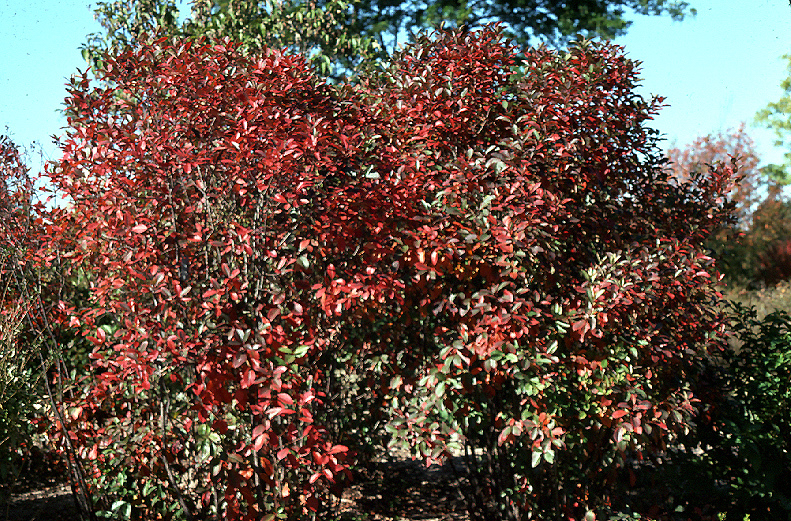 This medium-sized shrub grows about 5-6’ tall and wide in the northern U.S. growing larger in the south. The natural form is upright, rounded with long, arching branches. Suckering at the base of the shrub is slow, hence the plant does not become a nuisance in the garden. Variegated fiveleaf aralia is adaptable to most soils and pH, tolerates sandy and poor, dry, clay-based soils, will stay variegated in shade and will not scorch in full sun. It is quite drought tolerant with no pest problems. Deer and rabbits seem to leave it alone. 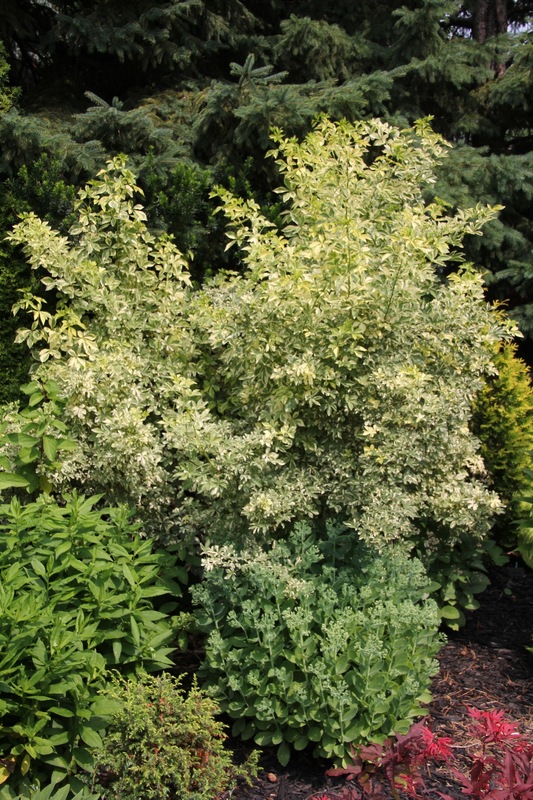 The foliage is quite clean with 5-7, bright, cream to yellow variegated leaflets with an emerald green center. There is no fall color to talk about, however, the brightly colored leaves mix well with other yellow, white or purple flowering/foliaged plants. The stems do have 1-2 curved prickles on them at a node, but they are short. Unlike its straight species, ‘Variegatus’ rarely flowers or fruits so the plant does not become invasive. This plant is native to Japan and was highly promoted as an outstanding urban tolerant plant by my former graduate advisor, the late Dr. J.C. Raulston of North Carolina State University. He tested and evaluated thousands of landscape plants for adaptability to the southeastern U.S. and a few of those plants are actually hardy up in zone 4b. Another great plant that I am more and more impressed with each day is a relatively new release from Iseli Nursery, Boring, Oregon. It is NORTH WIND® maple (Acer ‘IsINW’). 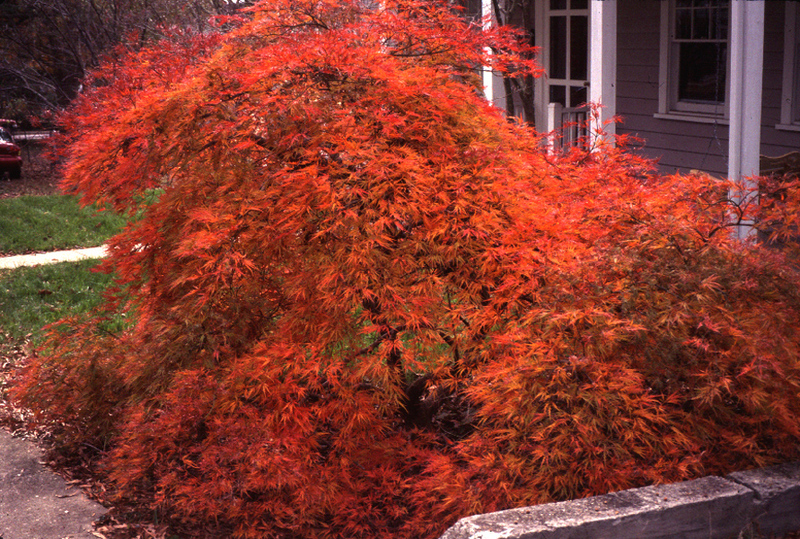 This smaller, 15-20’ tall, ornamental maple is part of Iseli’s Jack Frost® series of hardy, ornamental maples. Through testing across the country, this maple has proven hardy to zone 4a without any dieback, unlike Japanese maple (Acer palmatum). 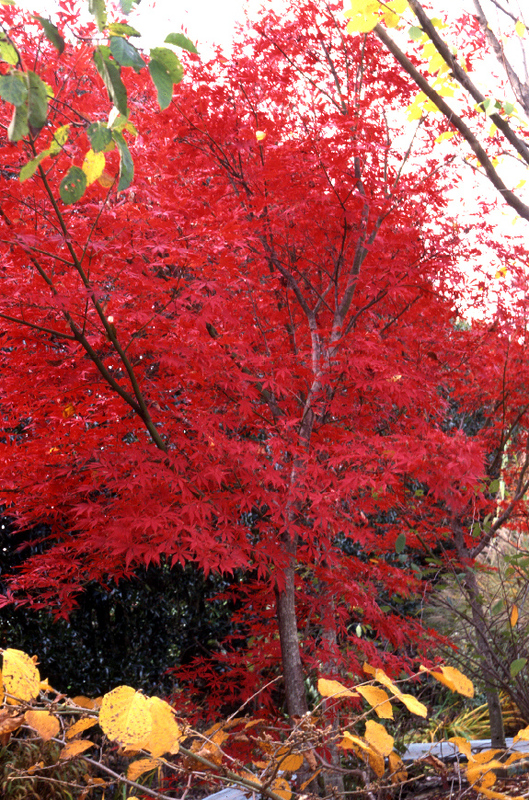 One of the parents of this great hybrid is the Korean maple (Acer pseudosieboldianum), which is also zone 4 hardy. 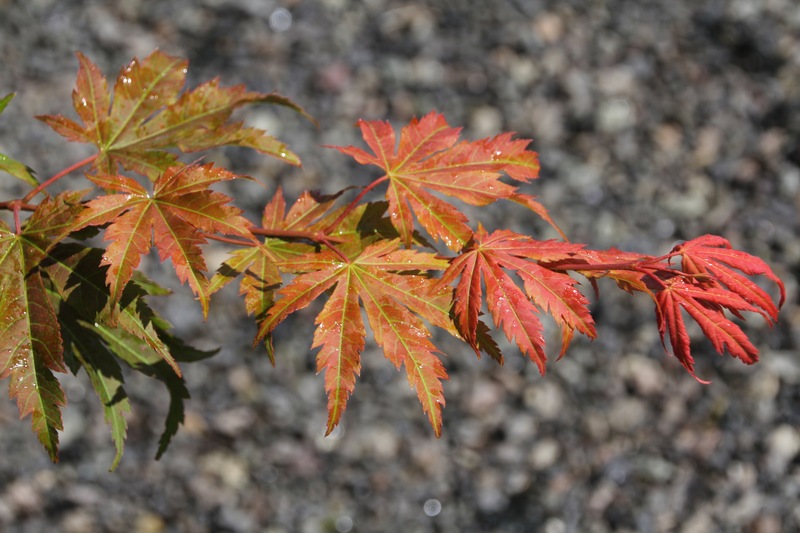 The beauty of NORTH WIND® maple is that it combines the cold hardiness of Korean maple with the outstanding leaf qualities and deeper leaf lobes of the Japanese maple, one of the suspected parents, but with one exception. 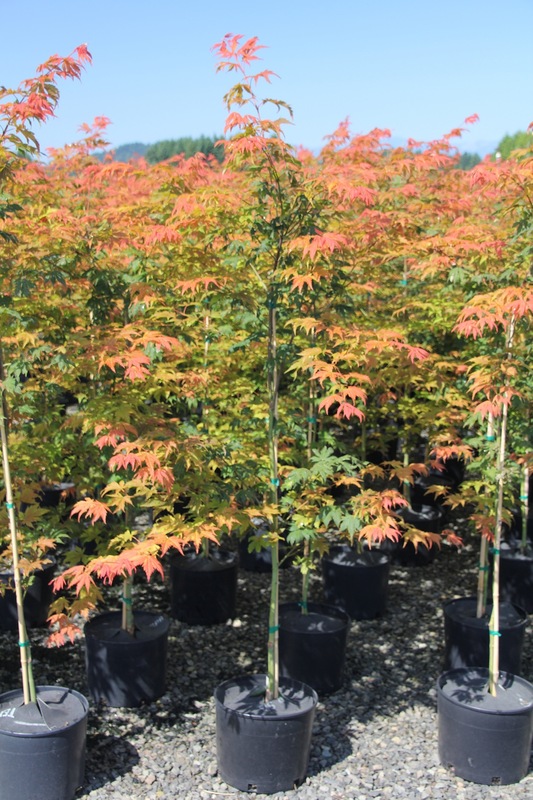 NORTH WIND® maple new leaves are bright orange! The color of these leaves lasts longer in the growing season in cooler climates. I have a young tree in my yard and the leaves are still orange, even this late into August. The older leaves gradually fade to green in midsummer. The orange-red fall color is superb and makes a real eyestopper in the autumn landscape. For best color, plant the tree in full sun to partial shade. 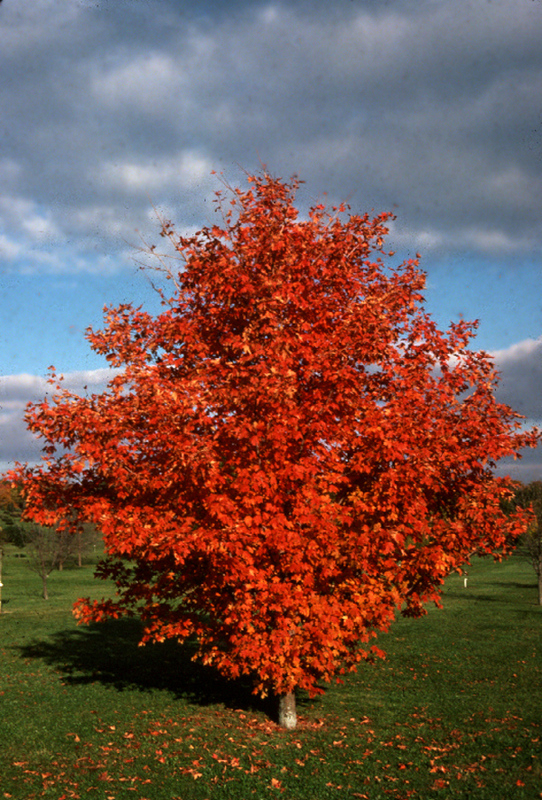 NORTH WIND® maple is pH adaptable and grows best in a moist, well-drained soil. I do not know yet how heat or drought tolerant this species is, but if anyone is growing this plant in southern climates, please let me know how it is doing. As promised last week, here is Part 2 of “Why doesn’t my plant flower?”. If any of you know of more reasons that are not listed here or in the previous week’s blog, please let me know. Happy gardening! 1) Over fertilization may inhibit flowering. 2) Poorly-drained, heavy clay soils can result in leggy, unhealthy looking plants that may not flower or will die. 3) Under watering can cause a lack of flower buds or poor flower development. 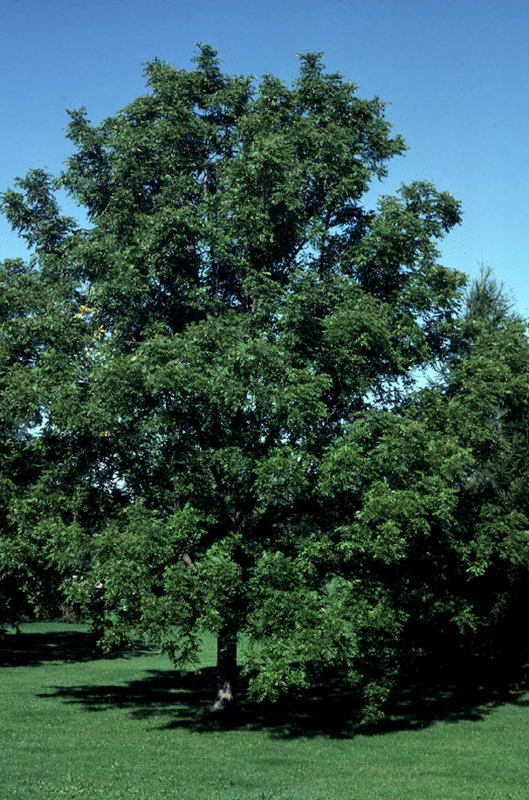 6) Black walnut (Juglans nigra) and butternut (J. cinerea) trees can kill sensitive plants nearby. 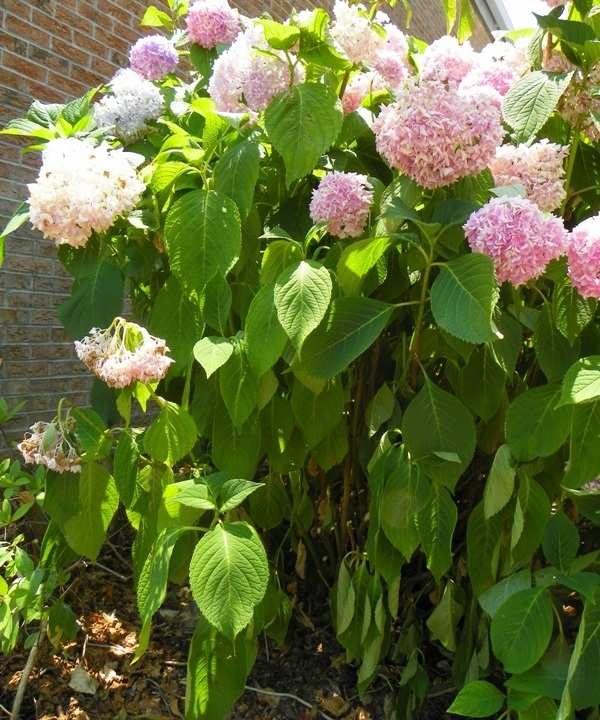 Ornamentals sensitive to juglone include lilacs, crabapples, rhododendrons and azaleas, hydrangeas, etc. 7) Deer or rabbits may be browsing on the flower buds. I often get horticulture questions from county extension agents, Green Industry professional, gardeners and my next door neighbors. One of the most common questions I get is why their plant did not flower that year. There are many reasons why a plant, either woody or herbaceous perennial, will not flower and both new and established plants can be affected. Some of the below reasons are obvious, some not so obvious. 1) Plants requiring full sun are not receiving enough sunlight. 2) Transplant shock may result in little to no flowering 2-3 years after planting. 3) A plant may not flower because it is not cold hardy to your area. Winter flower bud death on forsythia. Notice flowers at bottom of plant due to being under the snow line. 4) In warmer cold hardiness zones a plant may not receive enough chilling hours in winter to break dormancy. 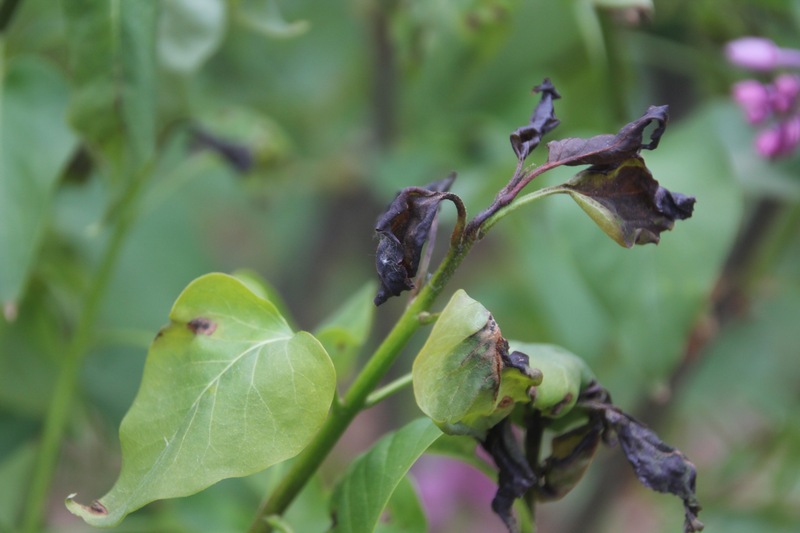 5) Severe late spring frosts can kill flower buds coming out of dormancy or emerging buds. 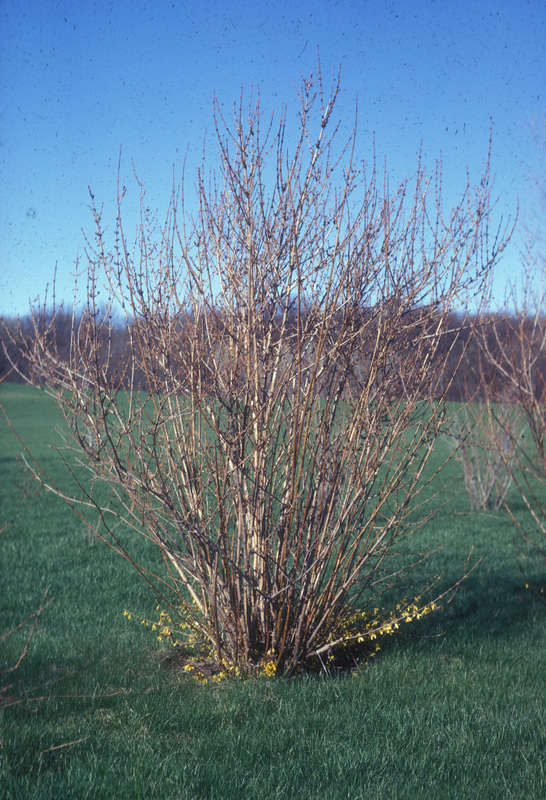 6) Pruning trees and shrubs at the wrong time of year will remove flower buds. 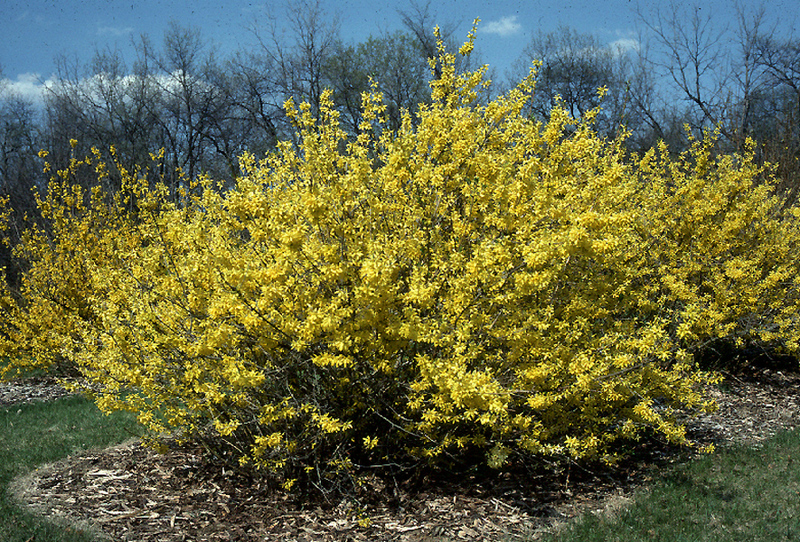 7) Flowering can decrease significantly on older, overgrown shrubs like lilacs, forsythias, chokeberries, and spirea. 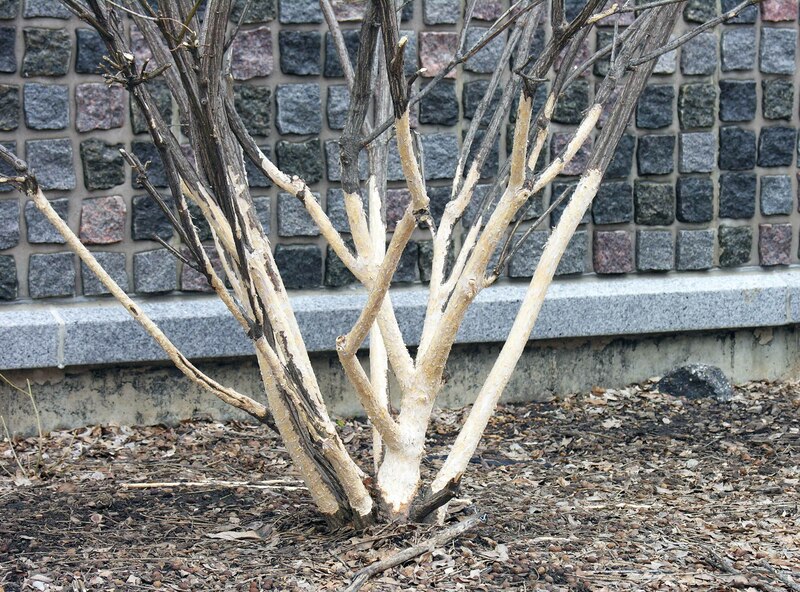 Before renewal pruning of Chinese lilac (Syringa x chinensis). Notice larger diameter branches crowded together. 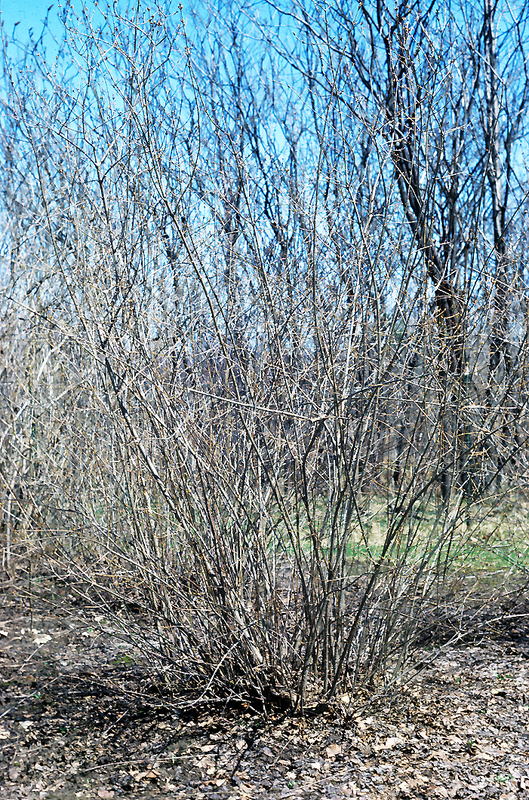 After renewal pruning of Chinese lilac (Syringa x chinensis). Notice thinning of plant. 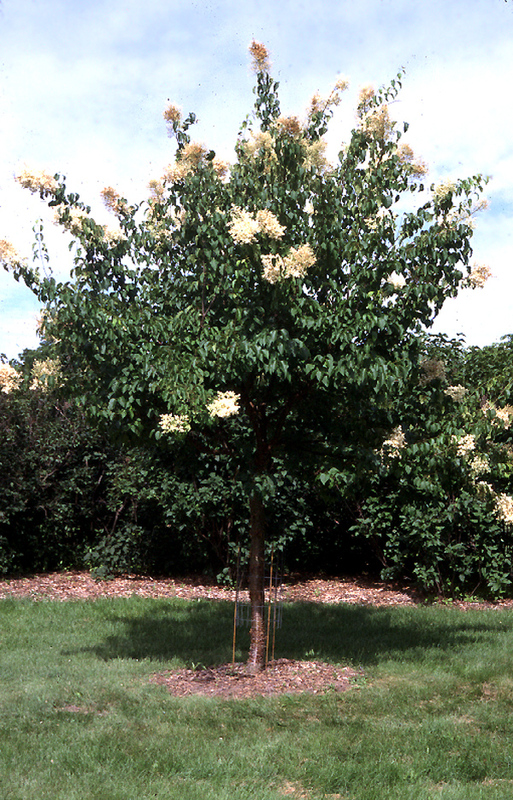 8) A tree or shrub may be alternate bearing with heavy blooming one year and sparse flowering the next year. 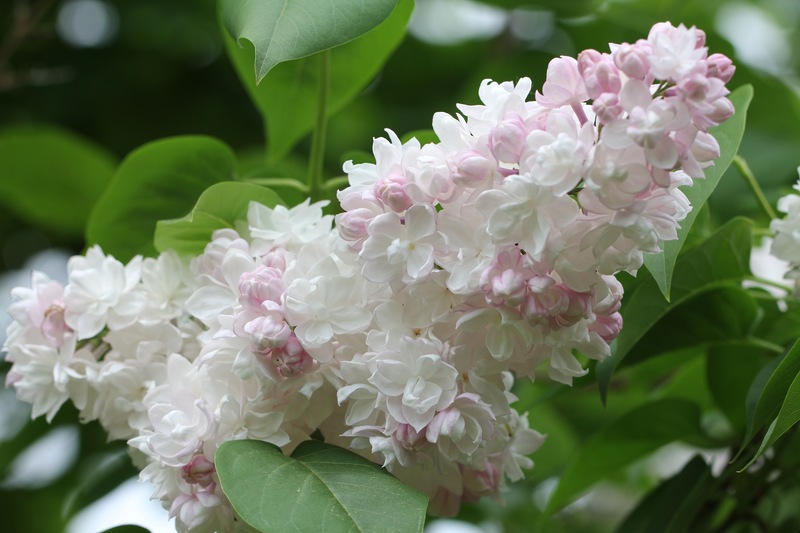 Sporadic flowering on CHINA SNOW® Peking tree lilac (Syringa pekinensis ‘Morton’). 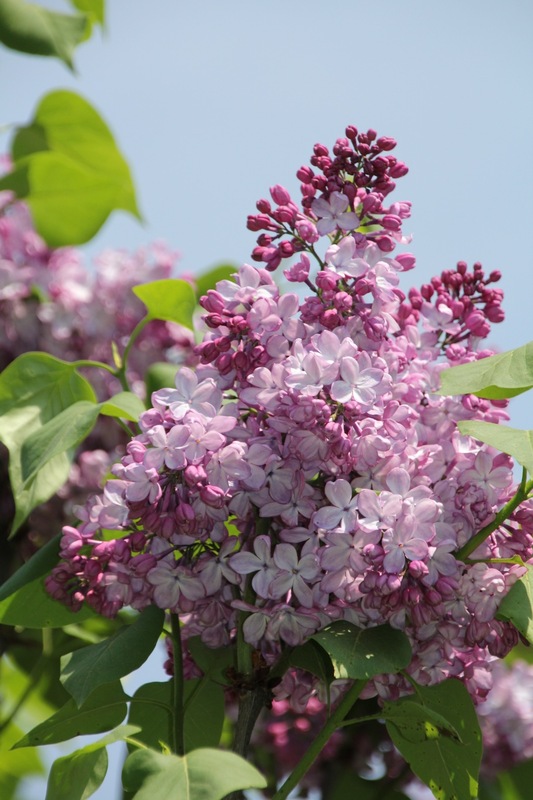 Many tree lilacs will flower heavily one year and sporadically the following year. Stay tuned for part 2 of this article next week! We are in the dog days of summer! Record high temperatures across the country have been reported. Let’s face it, climate change is real and the planet is getting warmer, despite record cold temperatures in winter in some areas. With climate change, there are more occurrences of extreme temperatures as well as precipitation such as severe drought, flooding, heavier than usual snowfall, etc. So, how does climate change affect gardeners? To understand the concept, we must first understand how high temperatures affect plant growth and development. Plant temperature tolerance is the ability of any plant to adapt to a given climate at both low and high temperatures. It is obviously important to use species that not only can survive our winter temperatures, but also our hot summers. Similar to the U.S.D.A. Plant Cold Hardiness Zone map (http://planthardiness.ars.usda.gov/PHZMWeb/), the American Horticultural Society published a plant heat zone map (http://www.ahs.org/gardening-resources/gardening-maps/heat-zone-map). The heat zones are based on the average annual days with temperatures above 86°F (30°C). For example, up in my neck of the woods in Wisconsin, we have four heat zones in the state; zones 2-5 with the cooler (lower number) heat zones in the northern part of the state and the warmer heat zones in the southern and western part of the state and in urban areas. In comparison, North Carolina has seven heat zones (2-8). California has even more heat zones due to its varying climates and elevations. Unique microclimates can be created at a specific site. Urban areas usually are slightly warmer than rural areas due to the heat island effect created by light reflection off of buildings, heat rising from sewers, and trapping of heat between large buildings. 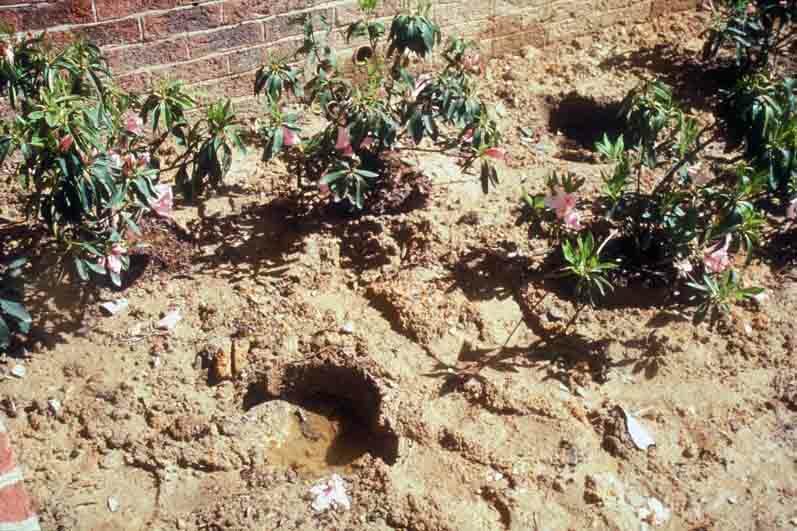 For example, trees planted close to pavement have warmer conditions in summer, than trees planted near turf, especially in the root zone, and have greater water needs. Trees and shrubs in this environment should receive, but rarely get supplemental irrigation compared to those same plants planted in the middle of a lawn or park area with cooler root areas and less heat stress to the tree. So what does this mean for temperate woody plants? High temperature stress is important for a number of reasons. The main effect is increased water use. However, water availability is often limited, especially in urban environments, leading to a net loss of moisture within the plant. Leaves loose water quicker through the stomates via transpiration as temperatures rise. The stomates then begin to close and the cooling effect of evapotranspiration is stopped. Other physiological processes are impacted by high temperatures such as fewer carbohydrates available for plant growth and development, generation of plant pigments (red, purple and blue pigments) and defense used in protecting plants against insects and diseases. When plants with poor heat tolerance are grown in regions that routinely experience high summer day and night temperatures and insufficient moisture, plants will use many of their stored sugars during the evening hours and during the hottest part of the day. For many temperate woody plants, optimum temperatures for photosynthesis are below 86°F (30°C). Above this temperature, net photosynthesis declines with increasing temperatures. If this continues long term, plants can die, especially young plants that do not have many stored carbohydrate reserves and are under drought stress. What can we do as gardeners? Apply 2-4” of bark or wood chips to the top of the soil to retain soil moisture. Make sure the mulch does not touch the trunk of trees or base of shrubs. Excessive mulching (mulch volcanoes) can actually kill landscape plants by impeding air and moisture penetration and invite fungal diseases. Cities need to avoid planting trees in tree pits (sidewalk cutouts), i.e. 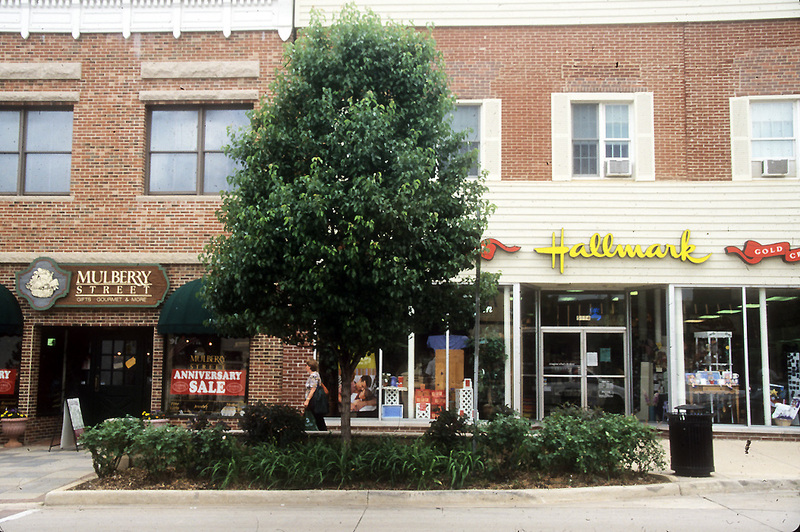 restrained planting areas in sidewalks along streets. These trees are under severe moisture, drainage and heat stress and do not live long. Planting areas that are wide and long work much better for tree health and longevity than planting in tree pits. 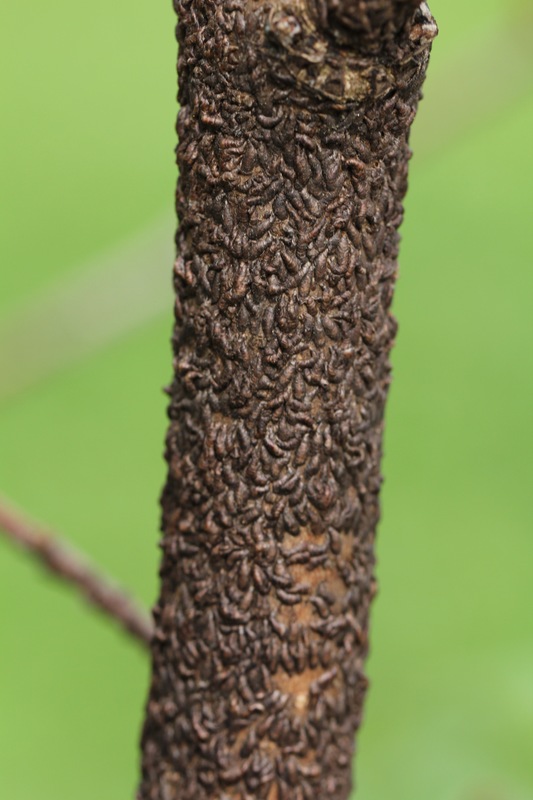 Posted on July 22, 2015 August 3, 2015 Author Laura JullCategories Laura Jull, Trees and shrubs, UncategorizedTags climate change, microclimate, mulch, summer, woody2 Comments on The Heat is On! I just returned from another great “Addicted Confer Syndrome” conference. 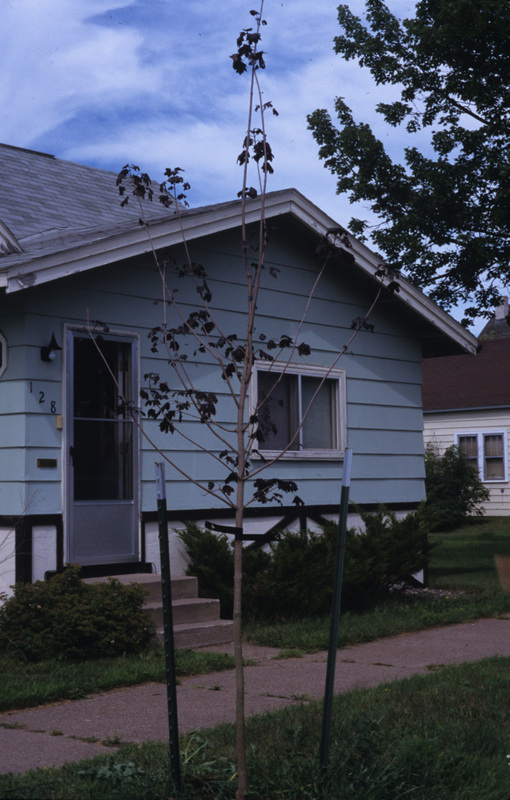 In reality, ACS stands for the American Conifer Society. The meeting I attended was the Central Region chapter of the ACS held in Green Bay, Wisconsin. You might be thinking that only white spruce and tamarack are the only conifers that can be grown this far north, but you would be wrong. There are many outstanding conifers that can grow up here and throughout the U.S. Not all conifers are evergreen as there are deciduous conifers, like larch and baldcypress, but most dwarf conifers are evergreen. According to the American Conifer Society (www.conifersociety.org/conifers/conifer-sizes), dwarf conifers are those that grow between 1-6” per year with an approximate size after 10 years between 1-6’. In contrast, large evergreens grow over a foot a year and are 15’ tall or more after 10 years. Size can vary due to climatic, environmental and cultural conditions. These smaller than usual evergreens are a fraction of the size of their species and fit nicely into the landscape often requiring very little pruning or shaping. Dwarf conifers can provide food and shelter for birds and other small mammals as well as year round interest due to their bright colors and interesting form and texture. An otherwise bleak, winter landscape can be accented with dwarf conifers that come in a variety of colors besides green such as blue, blue-green, silvery-blue, yellow, and purplish. Below are a few of my favorite dwarf conifers that are available at many garden centers and nurseries. ‘Silberlocke’ Korean fir (Abies koreana ‘Silberlocke’, a.k.a. 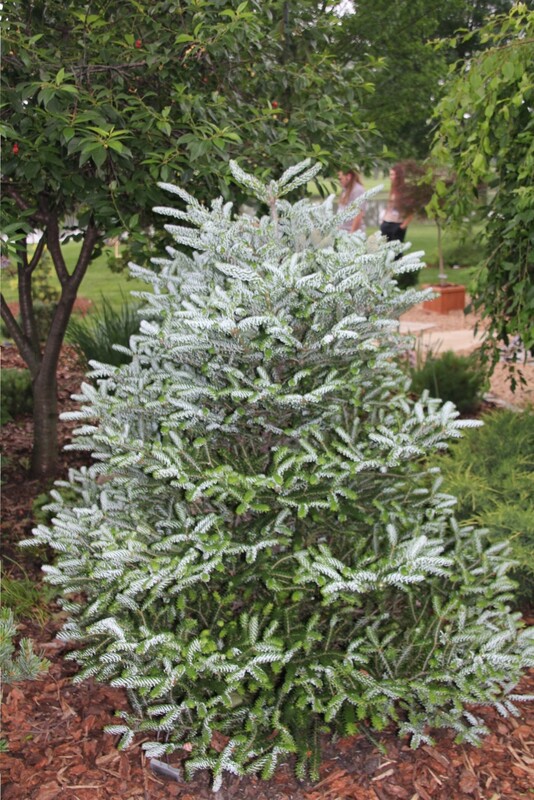 ‘Horstmann’s Silberlocke’) is a unique dwarf conifer that looks spectacular all year round. 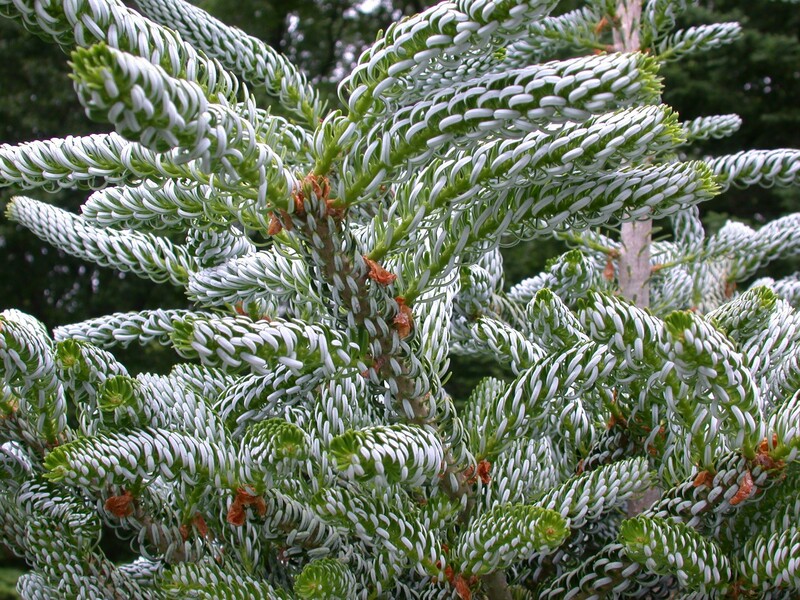 The soft needles are different than most conifers as they curve upwards, revealing the bright, silvery-white, frosty undersides. The silvery-gray twigs also add to the plant’s interest. ‘Silberlocke’ Korean fir grows slowly up to 5-7’ in height with a 4-5’ spread eventually growing into a small, compact, conical tree. Firs, in general, require a sandy-loam, moist, well-drained soil and are intolerant to heavy, poorly-drained, clay soils. This cultivar prefers morning sun, but some afternoon shade. 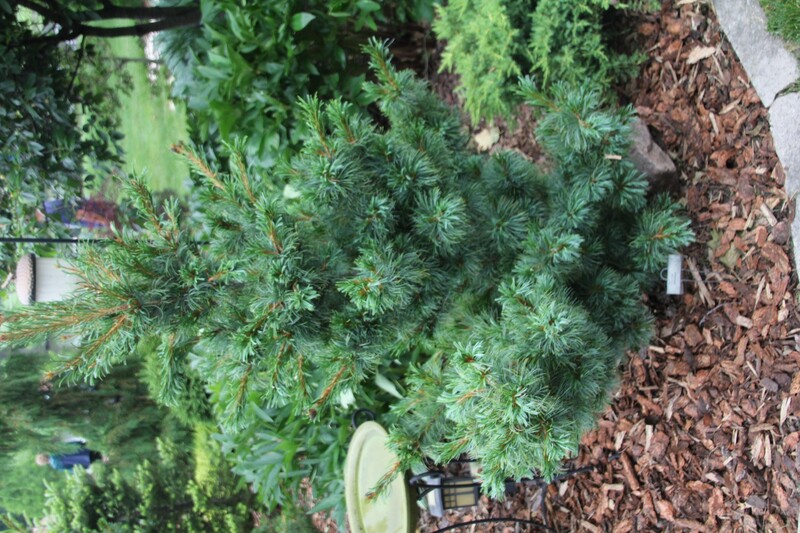 ‘Silberlocke’ Korean fir is hardy to zone 4b. ‘Blue Shag’ eastern white pine (Pinus strobus ‘Blue Shag’) is a dwarf conifer shrub with a compact, rounded form that reaches 3-6’ tall with a 6’ spread. The bluish-green, finely textured needles are very soft and pliable. ‘Blue Shag’ has a slow growth rate and a dense, mounded form making it a great choice for use as a foundation plant instead of the all-too-common yews (Taxus spp.). 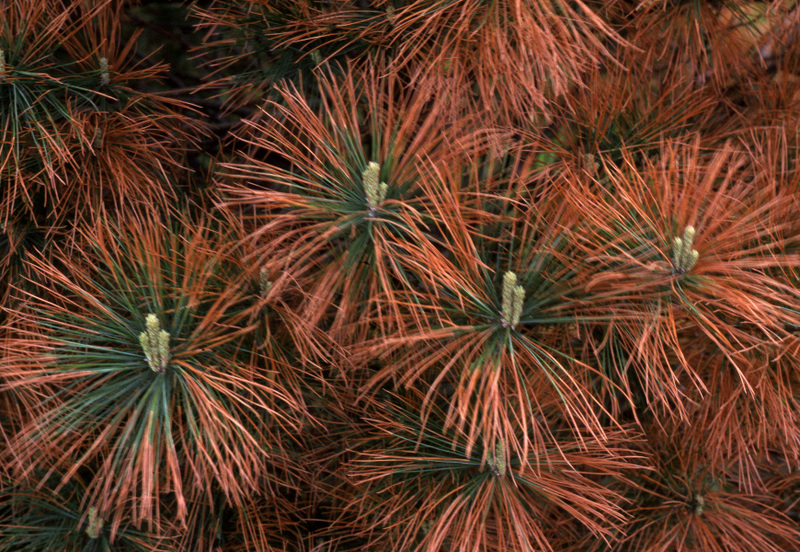 Like all cultivars of eastern white pine, it grows best in a sandy-loam, slightly acidic to neutral soil. It is sensitive to drought, heavy-clay, poorly drained soil, and road salt. ‘Blue Shag’ eastern white pine is hardy to zone 3a. ‘Bergman’ Japanese white pine (Pinus parviflora ‘Bergman’) is an outstanding, dwarf conifer that forms a dense, compact, wide, rounded to upright shrub. ‘Bergman’ Japanese white pine is a slow grower eventually forming a 4-6’ tall with a 6’+ spread shrub. 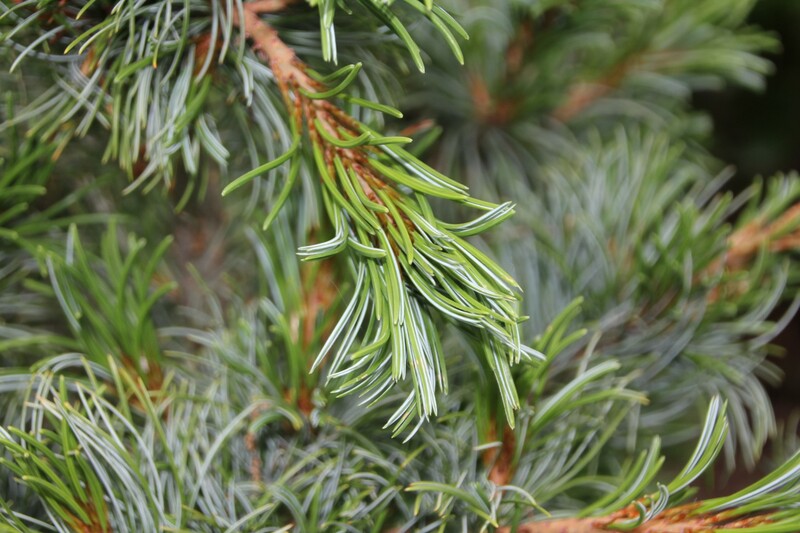 The blue-green needles are soft, long and twisted. In spring, the immature cones are bright carmine-red contrasting dramatically with the blue-green needles. It is hardy to zone 5a and is adaptable to most, well-drained soils and pH. Unlike many other five-needled pines, Japanese white pine is road salt tolerant. 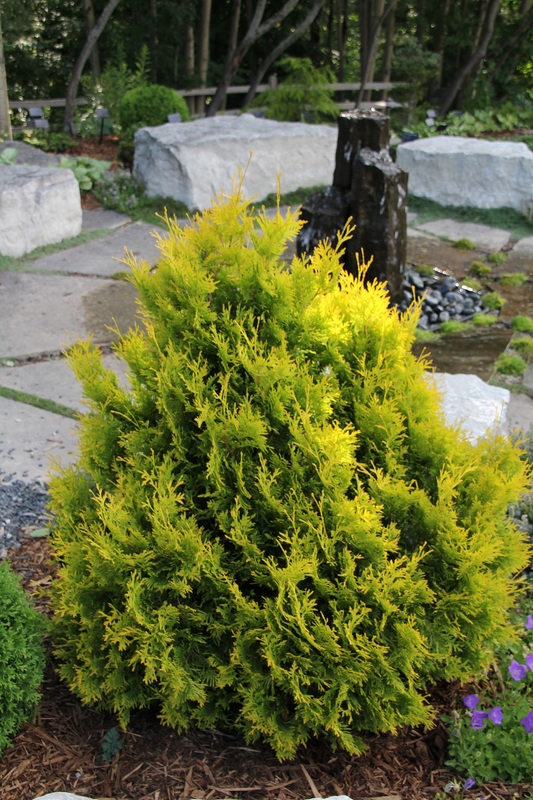 ‘Gold Drop’ eastern arborvitae (Thuja occidentalis ‘Gold Drop’) adds bright color to the landscape. This dwarf conifer shrub grows 4-5’ tall and 3-4’ wide and is shaped like a teardrop; narrow at the top, wider at the base. 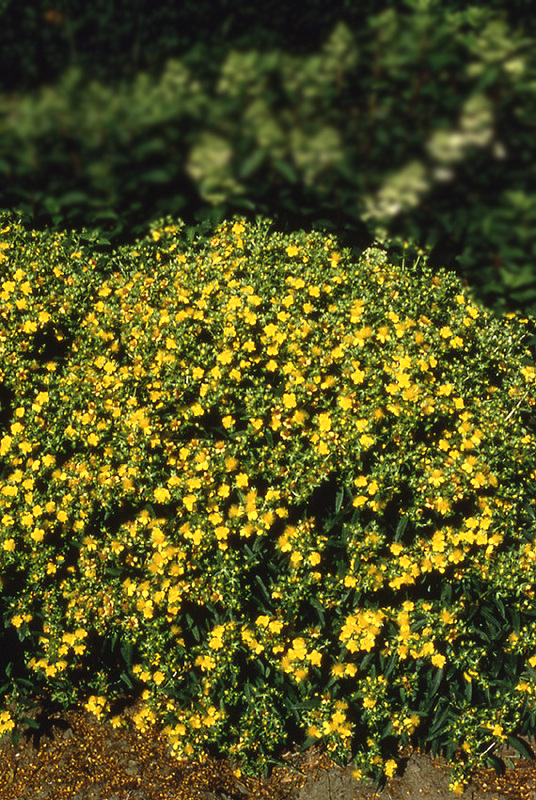 The soft, aromatic foliage is bright golden yellow when grown in full sun turning a deeper yellow during winter. ‘Gold Drop’ arborvitae is hardy to zone 3b and is adaptable to most soils and pH, but grows best in moist, well-drained, loamy soil. 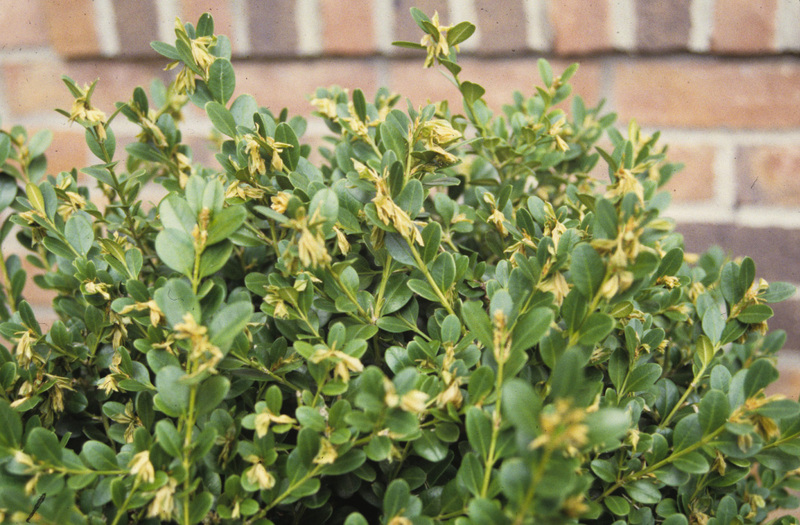 If grown in shade, the golden colored foliage will turn green. 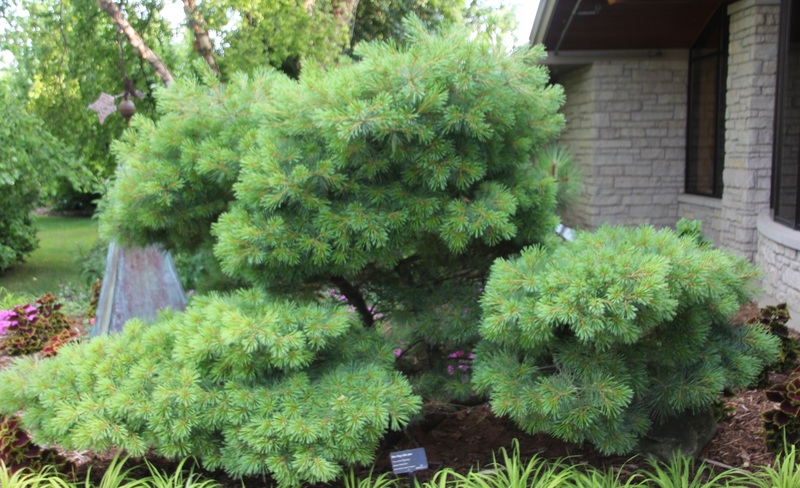 Even though dwarf conifers are often more expensive than other deciduous shrubs, they are well worth it. They have a slow growth rate, require little maintenance and provide year-round color and texture in the landscape. Like some television commercials say about their product, “But wait, there’s more”, this statement can also be said about flowering shrubs. Just because spring is over, it does not mean there is no more color in the garden. Yes, there are herbaceous perennials that bloom in summer, but there are some fabulous flowering shrubs that also shine during the dog days of summer besides roses and Japanese spirea. Here are three of my favorite larger shrubs with big landscape impact. Bottlebrush buckeye (Aesculus parviflora) produces flowers in the northern U.S. in early July. The white flowers are especially unique and are borne on large, 8-12” long panicles rising far above the leaves. The flowers resemble a large bottlebrush and are often home to visiting butterflies and bees. 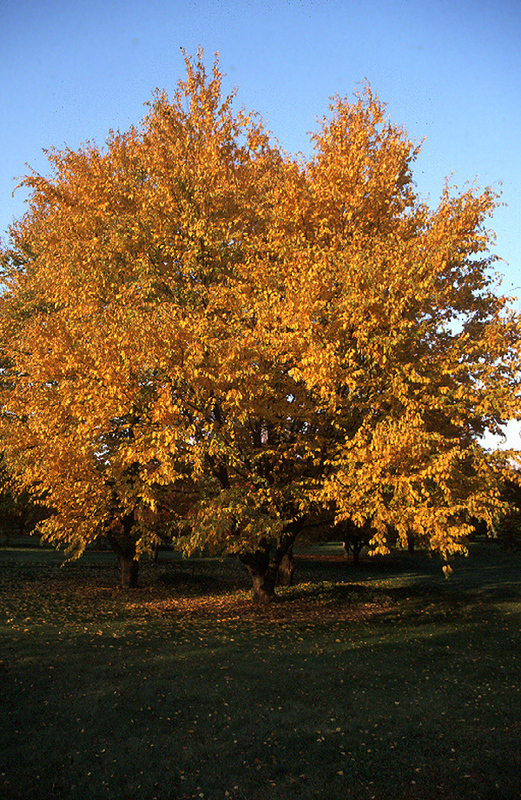 In autumn, the foliage turns bright yellow early in the season. 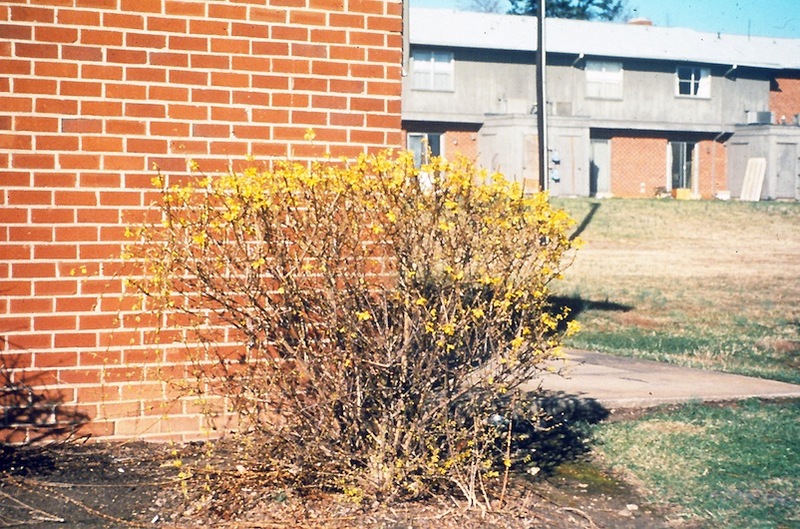 This large, spreading, suckering shrub needs a lot of space to grow reaching 8-12′ tall and 12-15’ wide at maturity. It is native to the southeastern U.S. and performs best in rich, moist, well-drained soil, but is adaptable to most soils and pH. Bottlebrush buckeye grows in shade to partial shade and out of the hot afternoon sun. Unlike its tree relatives, this Aesculus species is not susceptible to powdery mildew, leaf blotch or leaf scorch and is hardy to zone 4b. 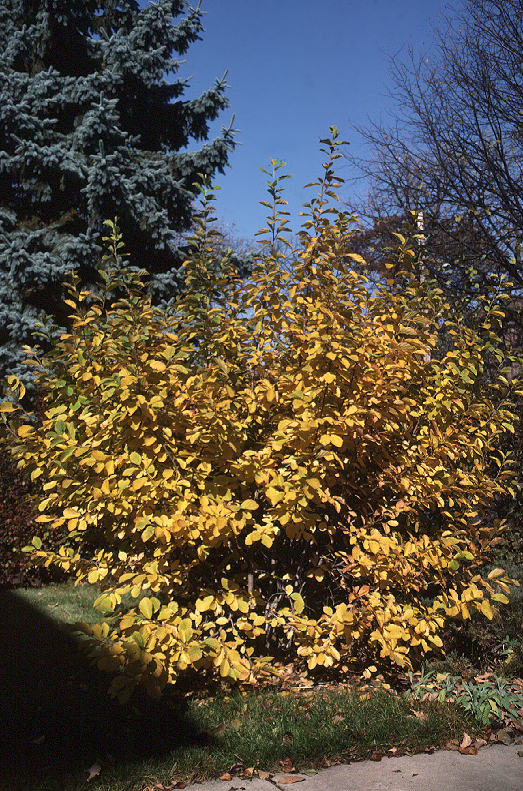 ‘Nordine’ smokebush (Cotinus coggygria ‘Nordine’) is another large, wide-spreading, upright shrub that grows 10-15′ tall and wide. 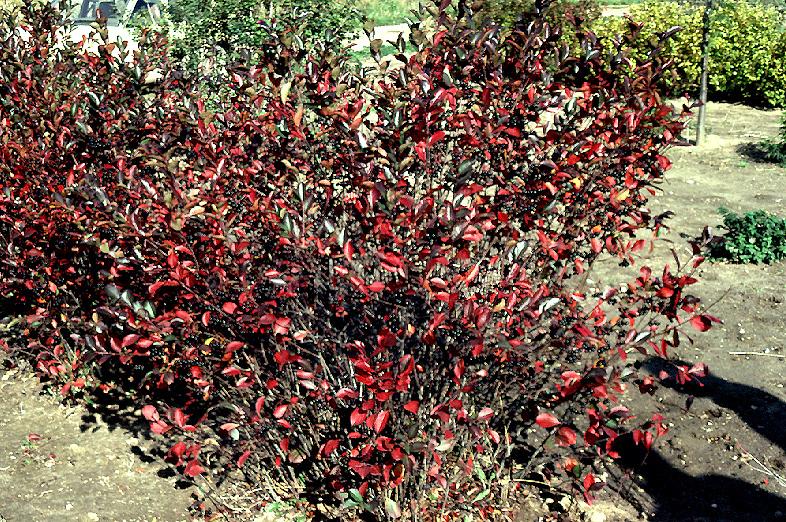 It produces purplish-red new leaves throughout the growing season that later turn dark bluish-green. When crushed, these leaves smell like a combination of radishes and oranges. The individual flowers are not particularly attractive, however, that quickly changes. The hairs on the individual stems of the 6-8” long flower panicle elongate and turn a wonderful smoky pink to purple color that lasts for many months. The orange-yellow to purple fall color is equally appealing. The species is native to southern Europe over to central China and the Himalayas. 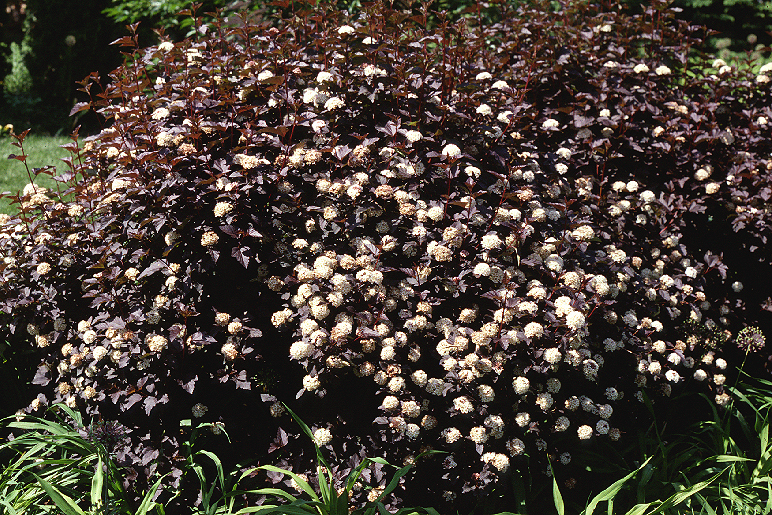 This particular cultivar of smokebush is hardier than other purple-leaved cultivars of smokebush and should reliably flower in zone 4b each year. It is able to withstand most soils and pH, full sun, drought, and urban conditions. Deer don’t seem to bother this plant. Maybe the smoky appearance of the flowers scares them away? ‘Limelight’ panicle hydrangea (Hydrangea paniculata ‘Limelight’) is one of the best flowering cultivars of panicle hydrangea. The flower panicles are huge, up to 6-10” long starting lime-green and eventually turning all white. As the flowers fade, they turn pinkish to brown from fall through winter providing multi-seasonal interest. The added benefit of this cultivar is that the flowers are borne on strong stems that are held upright, so flowers will not flop over like some other panicle hydrangea cultivars. ‘Limelight’ hydrangea is smaller than the species growing 6-8’ tall and 5-6’ wide at maturity with an upright, spreading form. The species is native to Japan and China and hardy to zone 4a. Panicle hydrangea does well in an organic, fertile soil, but is quite adaptable to soil and pH. It requires full sun for the best flower display and moist, well-drained soil, but it is not as finicky about soil moisture as some of the other species of Hydrangea. 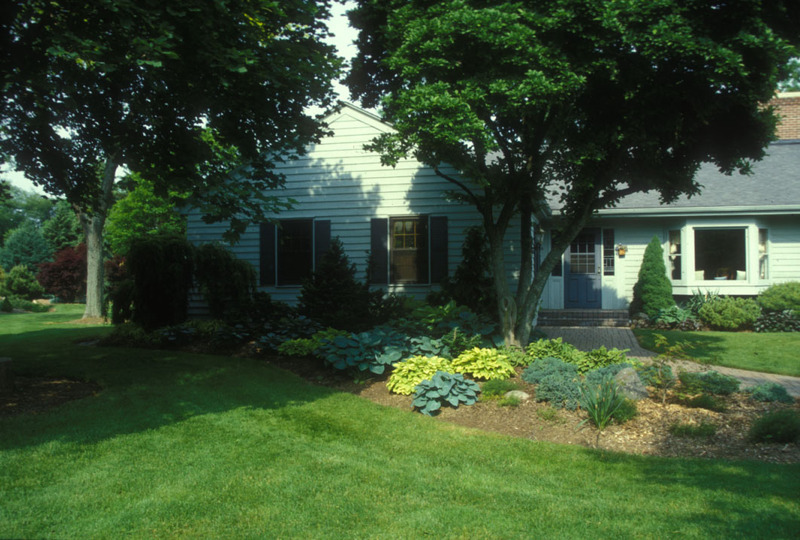 When designing a landscape, incorporate a variety of trees, shrubs and perennials to insure continual bloom throughout most of the growing season. 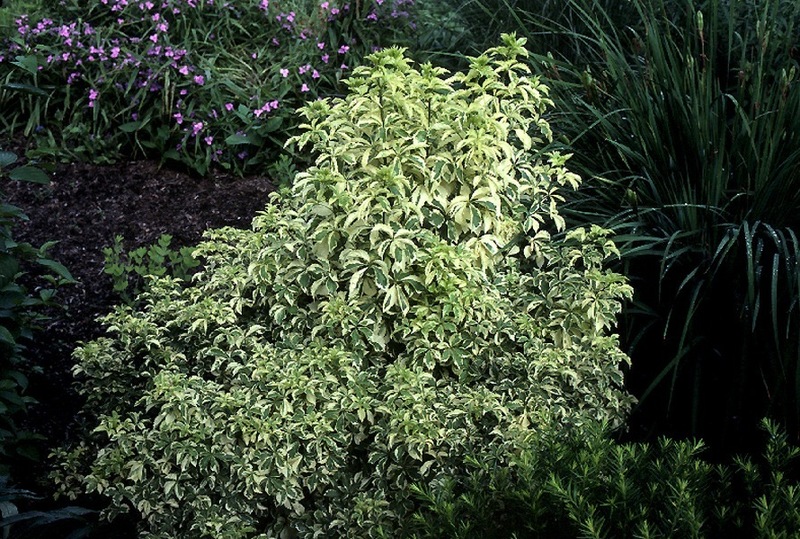 These three, non-invasive shrubs are all available at most nurseries and garden centers. If you have not tried one of these beauties yet, plant one or all three in your yard. You will be happy you did.